It’s now been over two years since I last used shampoo. I detailed the start of that journey here, with a description of some of the bizarre foodstuffs I had used instead. 2 years on, I can happily say I don’t plan ever to go back to shampoo. I always used to get greasy build up with shampoo, no matter what brand I tried. I never get that now. My hair feels soft and clean (and no it doesn’t smell). Best of all, I can go up to a month (yes really) before it gets greasy. Of course, if I’ve gotten sweat, baby vomit, or any other dirt in it in the meantime, I can just wash that out with plain water. I started off, as most do, using bicarb and Cider vinegar, but actually that didn’t suit my hair type very well and it ended up quite waxy. I’ve now settled on three favourite ‘treatments’ that are keeping my hair lovely. Lemon juice: this is my go-go as it is quick and easy and I usually have a lemon to hand. I have a lot of hair so use a whole lemon, but most could probably get away with half. I juice the lemon, add an equal amount of water, and 5 drops of tea tree oil. Sometimes I also add 5 drops of peppermint oil because I love the way it smells. I usually mix all this in our measuring jug because it gives me room to dip the majority of my hair in. Then I pour the rest over my scalp, making sure I cover all of it, and massage before washing out. 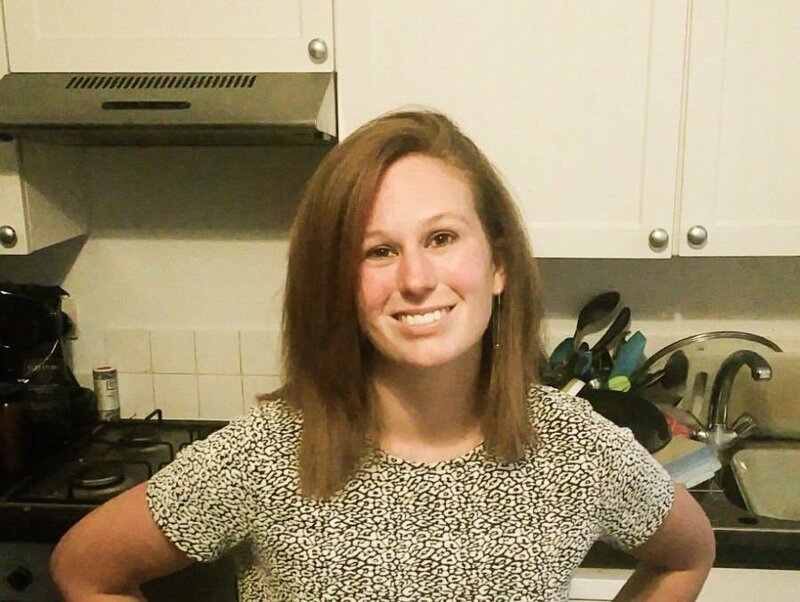 Applesauce: I love how applesauce makes my hair feel but it does take a bit more planning. I usually make up a big batch and freeze some so I can grab it when needed. It works kind of like a hair mask. I peel, core and chop two apples then put them in a small pan with just enough water to cover them. Put on the hob and simmer until the apple pieces are very soft. Put the apple pieces and remaining water into a food processor and blend to a very smooth puree (any lumps will be hell to get out of your hair). I usually concentrate on my scalp when using this and take a good amount of time to massage it all in. Then leave it for 10-15 mins before washing thoroughly. The bizarre thing is that my hair actually feels like it’s getting cleaner for a few days after using this method, as the acid in the apples takes a whole to break down grease etc. Egg: this one is actually my favourite in terms of results but you have to use cold water so I only use it on hot days. It’s just one egg, mixed up, then massaged into the scalp. Again, I usually leave this one in for 10-15 minutes before washing out with cold water. Hot water would result in scrambled egg! Hurray for funky foods as beauty treatments! I’m a bit behind with these, so this post will cover a fortnight rather than a week! I plan to switch to monthly updates after week 26 anyway, so will do fortnight ones for these last couple. Piper turned 23 weeks on Thursday 2nd November and 24 weeks on Thursday 9th November. Here’s what was going on for her this fortnight. What we did: Now that Piper is a bit older and needs less sleep, she is coming out and about with us a lot more. 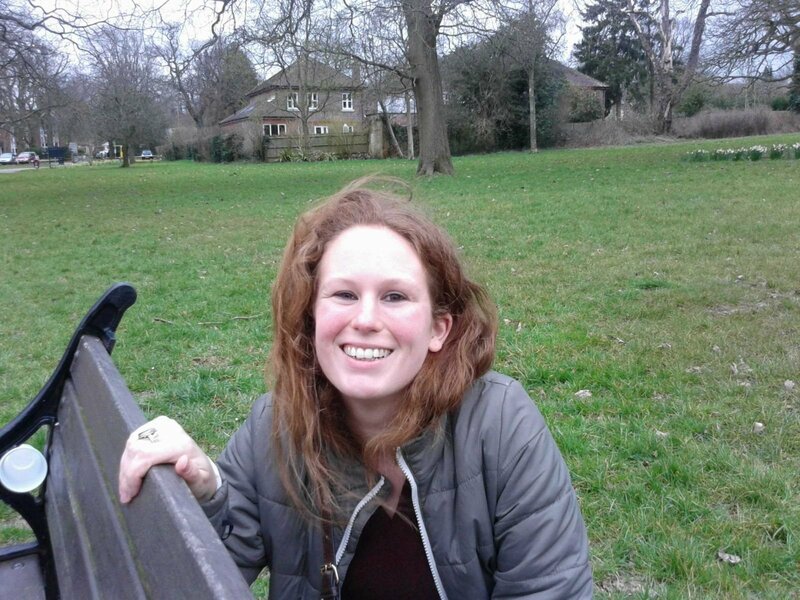 She came with Tom and I to the park on numerous occasions this fortnight. She also went to her first toddler group on Monday 6th Nov (Tom was at nursery but a friend had asked if I would come along). 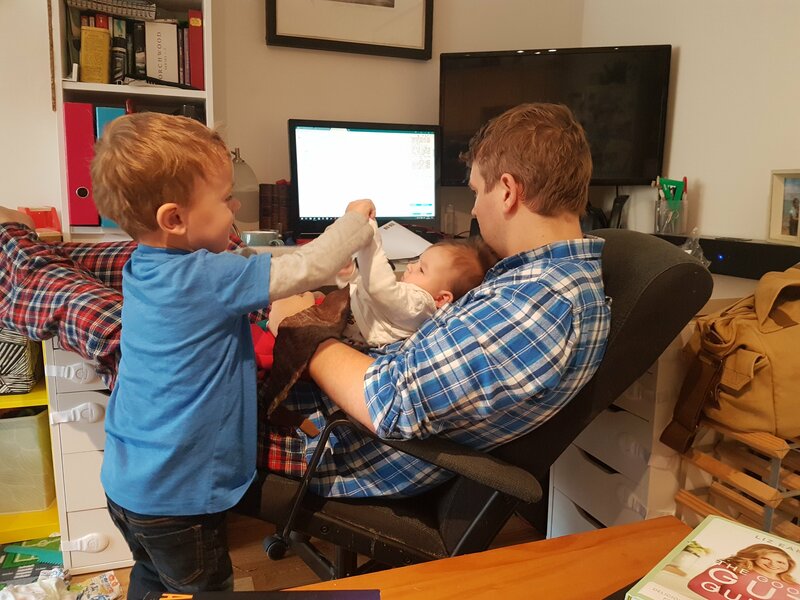 She loved it – really thrived on having all the other kids around. I think she may be my extrovert child because she was in a great mood for the rest of the day. Sadly, Piper came down with yet another cold a few days later. Who knows if she picked it up from the group or from her brother, but she was miserable. 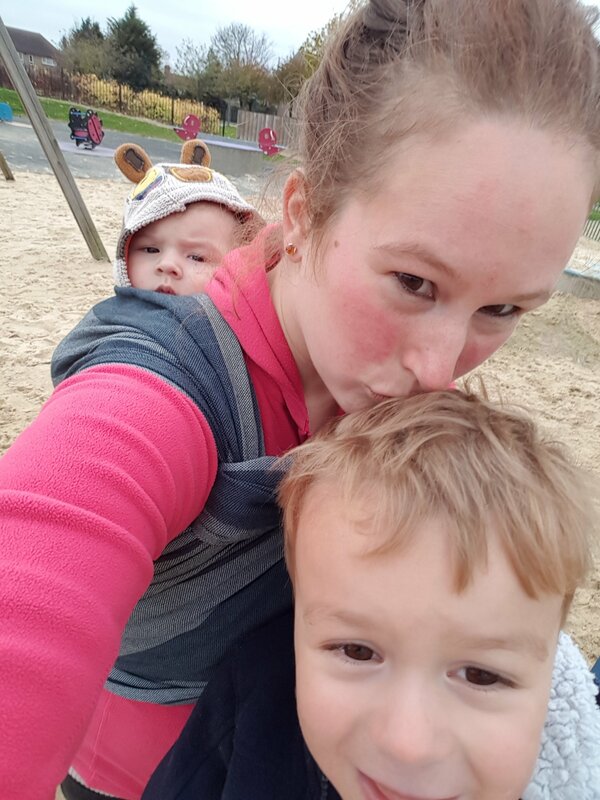 Still, she rode along in the sling with us for another few park visits, including discovering a new park with a giant sandpit. She often used the time to catch up on some sleep. Friday 10th Nov was a rather dramatic day for us. John had a (very) minor operation on Thursday. He’d been fine afterwards, if a bit uncomfortable, but woke up Friday morning shivering and blue, and just kept getting worse. I rang 111, who decided to send an ambulance based on my description and the fact that John could hardly speak to them he was shivering so much. Fortunately he was fine, just had a slight fever from the combination of the operation and catching the kids’ cold, but it was a scary few hours. Piper was her usual ultra easy self, which allowed me to focus on John and reassuring Tom. 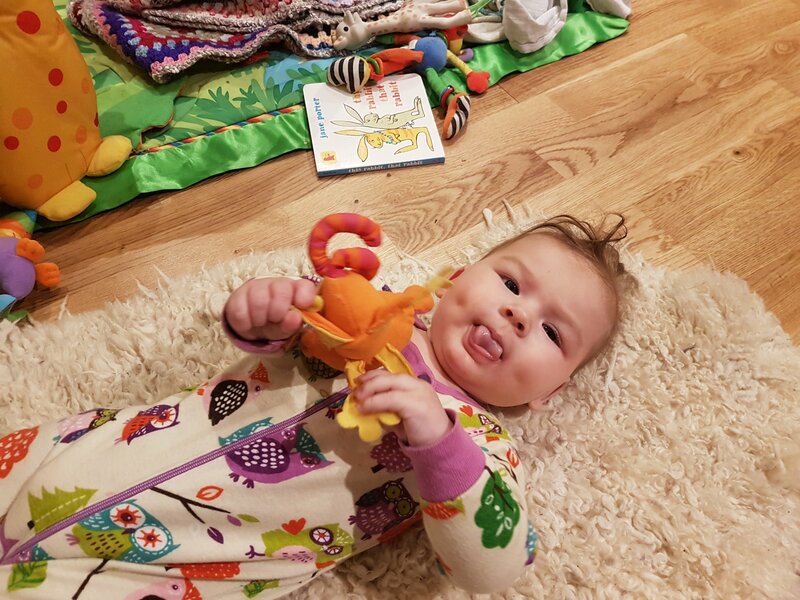 Feeding: I hadn’t meant to be weaning Piper so early but she kept eating the food I gave her to play with whilst Tom and I were eating dinner, so I gave in and formally began weaning with her, even though she is not yet 6 months. 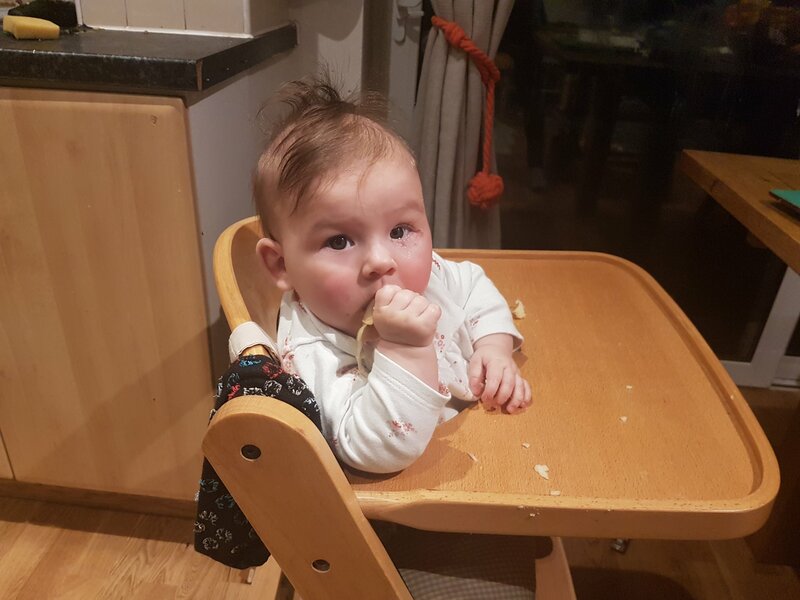 We do Baby Led Weaning, so technically you can’t wean too early, since if the baby can sit up, put food in their mouth and swallow it, they are ready. Well Piper was definitely ready. She sampled a wide range of foods, including bread, potato, cheese, apple, prunes, carrot, tomato, broccoli, green beans, and pasta. During this fortnight she was only having one meal a day, usually dinner with Tom and I. Our only issue was if she had eaten too much bread, she seemed to get a little constipated, so I’m being careful not to give it to her too often. Sleeping: Piper started off pretty well. She had adapted to the time change and was no longer early waking. Naps were still hit and miss but we were usually getting one good one per day. She was continuing to do her very brief wake ups a couple of times a night, but was just crying out once or cooing and then going back to sleep again immediately. 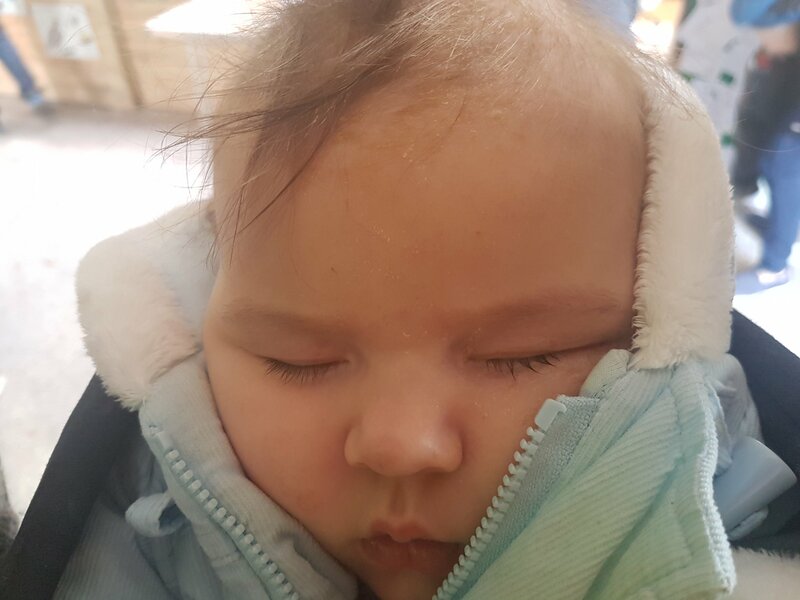 She even slept completely through (or at least made no sound) on Saturday 4 Nov and Tuesday 7 Nov. All very positive… then she caught the cold. On Wednesday 8 Nov, it started and she woke regularly very congested, but was sucking her thumb and going back to sleep herself each time. But after that we had several nights of hell. She was waking around 3.30/4.00 and not being able to go back down by herself. Feeding her had no effect. There were three nights that I gave up and just took her to sleep with me on the sofa bed. I had the cold too so just wanted us both to be able to get as much sleep as possible. I used to do this with Tom too when he was small, and he would never go back to sleep (but would at least not be crying). Piper, on the other hand, obviously likes having me close because she would go back to sleep until 7am and probably would have slept longer if Tom hadn’t been needing breakfast. I think there may have been some separation anxiety contributing to the wakings, which is partly why this worked so well. Sadly I find sleeping with her very uncomfortable so I aim to keep her in her cot if I can (she is still right by my side of the bed). Naps were also very disrupted and she was needing to sleep more often too. There were several days where she had four 45 minute naps, plus catnaps in the sling. She managed to sleep through again on Saturday 11 Nov and after that naps began to improve – usually one good one and two shorter ones. 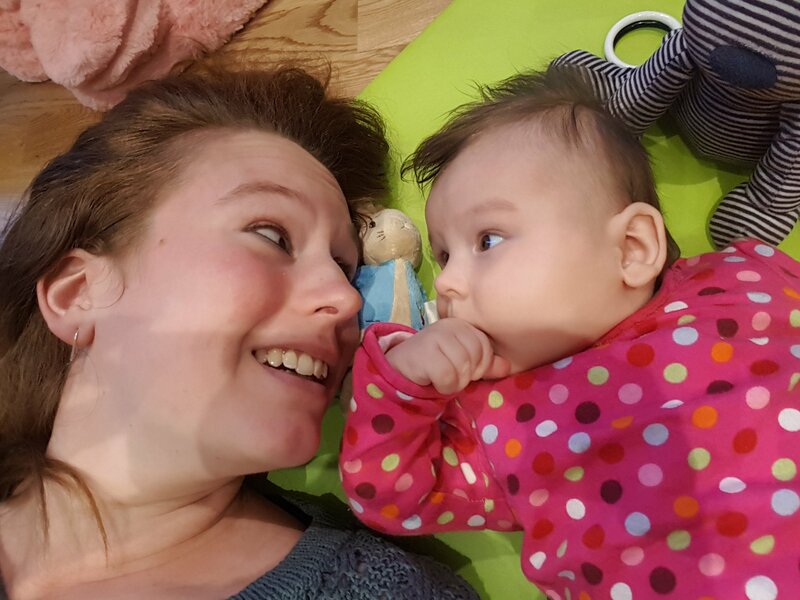 Sadly the night improvement didn’t last – she had bad nights Sunday and Monday (ended up co-sleeping again on Monday). 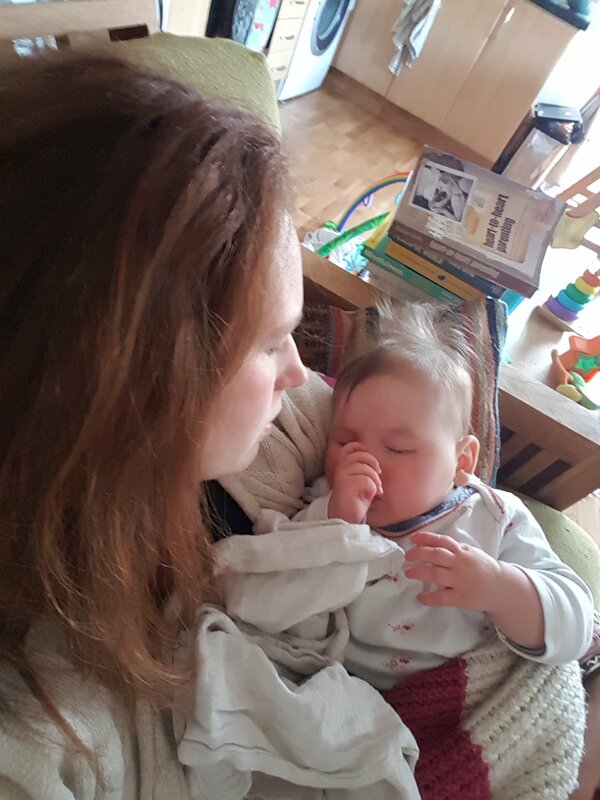 Things then began to improve – she was still waking up and needing help, but I managed to get her back to sleep by stroking her tummy with her in the cot, and once she was back down she would sleep until our normal wake up time. Working on: Piper has been rolling loads, but for a few days couldn’t get back off her tummy so would cry out for help. Luckily she soon worked it out. 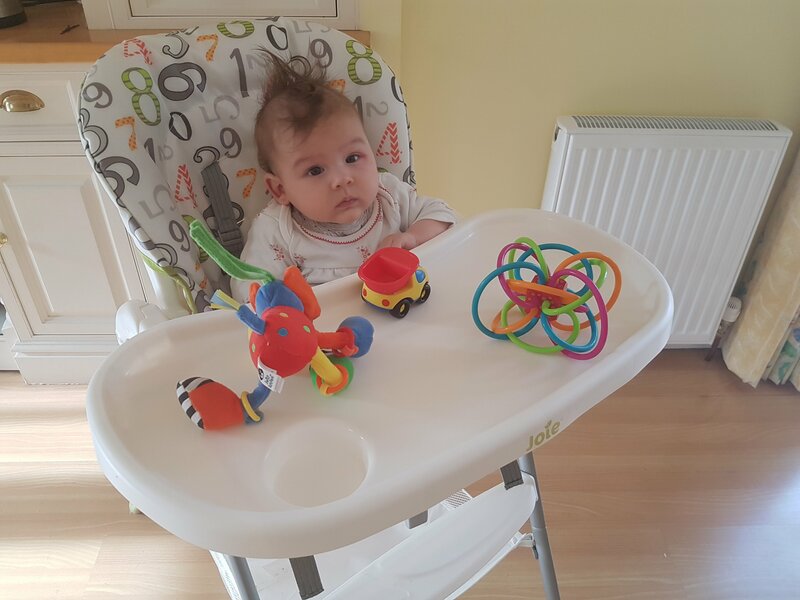 She is also able to sit unassisted for a few seconds (I don’t usually get her to do this though since I prefer her to be able to move around freely, which she can do best placed down on her back). Other things: Piper is still in Wonder Week 5, which I think may be contributing to her poor sleep, especially the difficulty napping. As I explained here, Piper is strong enough now to be on my back in the sling. She seems to find it pretty comfy up there and often dozes off, although she doesn’t really like the process of being put in the sling if she is tired (she’s fine if she is wakeful). She was blowing lots of raspberries this week. 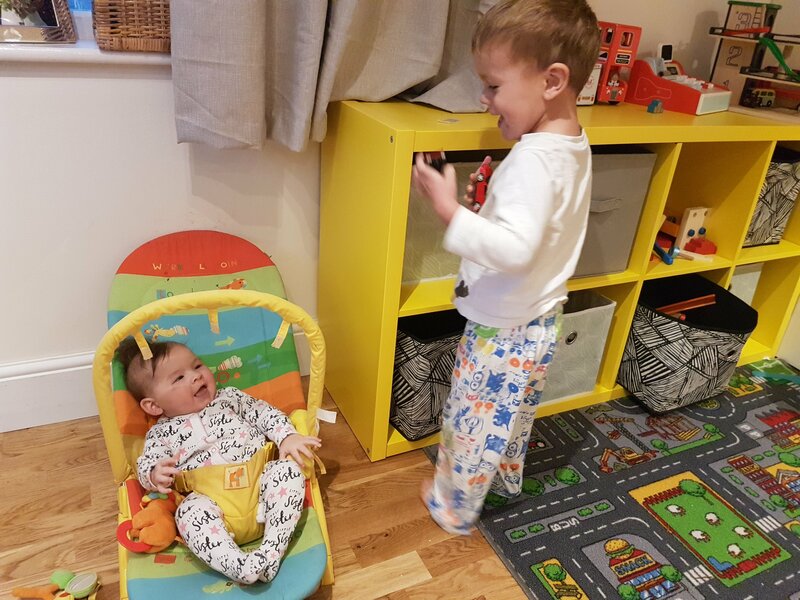 She is still finding Tom hilarious and loves being able to sit up with us at mealtimes because he does all sorts of things to make her laugh. She gets very annoyed if she can’t reach the toy she wants and will shriek until we get it for her. Quite a few night feeds this fortnight, but I’m not sure she actually needed them. 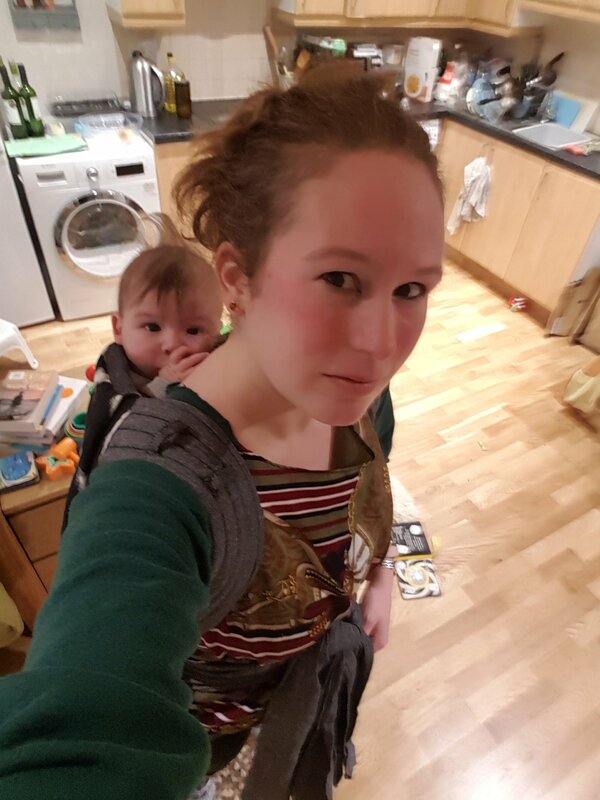 I am a great fan of babywearing. 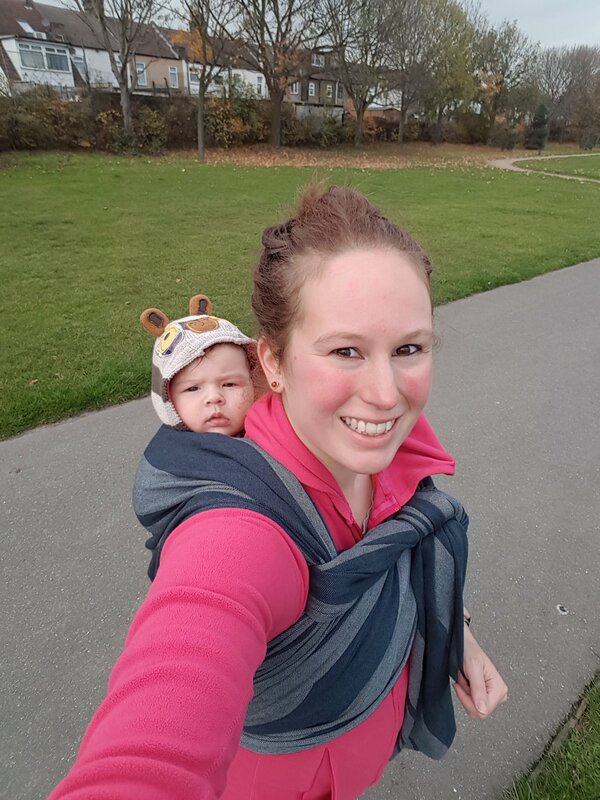 Although there is definitely a time and place to use a buggy instead, wearing a baby (or toddler) in a sling means you can keep them close and get around, but can still climb stairs/go down muddy tracks/chase your 3 year old without the assistance of strangers or a great deal of swearing. I started off wearing Tom when he was tiny. He was definitely one of those ‘can’t be put down’ babies. I hadn’t really anticipated this. 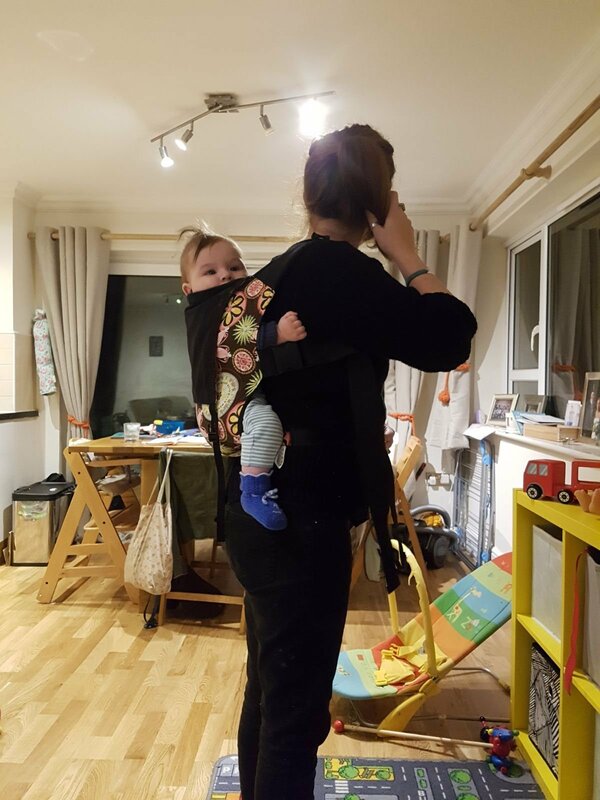 The only carrier we had to hand was one that had been passed onto me by a colleague, which involved tying the baby into the carrier first, then negotiating what felt like endless bits of string like fabric to secure him to our bodies. Fiddly and, as I now know, not very ergonomic for the baby since it didn’t hold him in the ‘m’ position. I hated it. 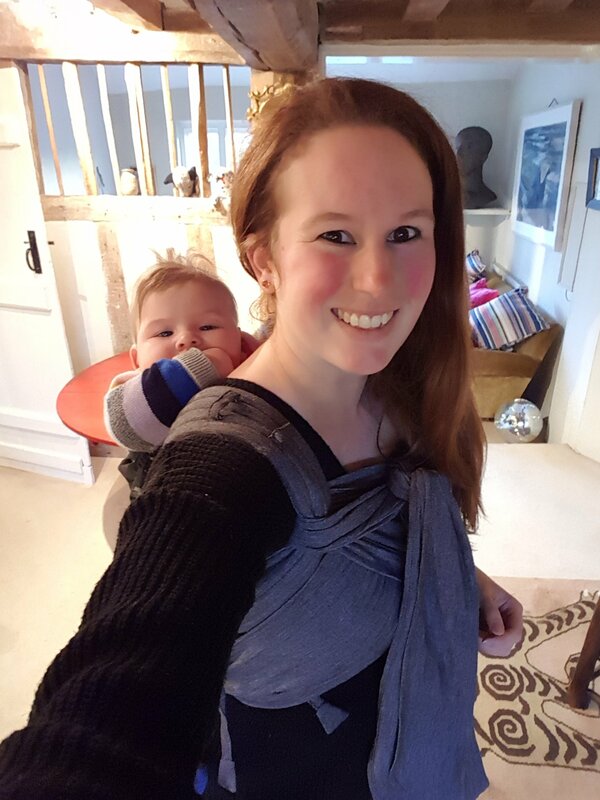 When Tom was about 4 weeks old, I phoned my mum and requested a sling for my upcoming birthday. 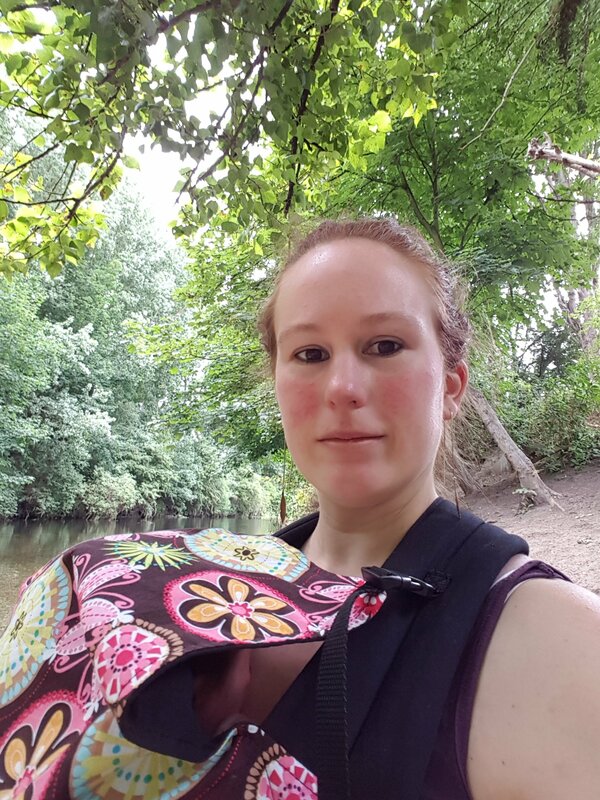 The one I liked the look of was a pouch sling, because it seemed easy to get the baby in and out of. She kindly obliged, but Tom hated it. For a newborn, it involves nestling them down between the folds of fabric and I didn’t seem to be able to get him comfy in it. Plus it only carries on one shoulder so I couldn’t wear him for long. 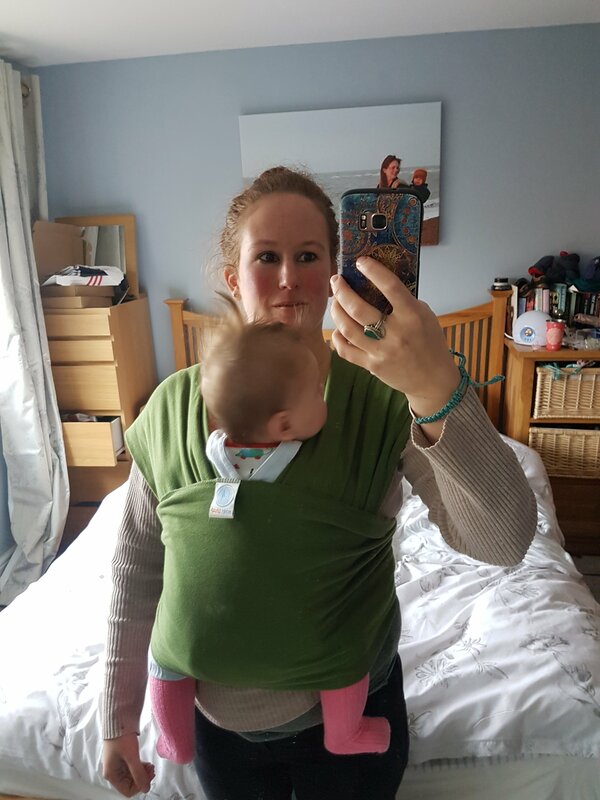 I went back to the drawing board, did some proper research, and ended up with a stretchy Moby wrap sling. It was lovely. So comfy to wear, held Tom tight against me, and I could carry him for hours. 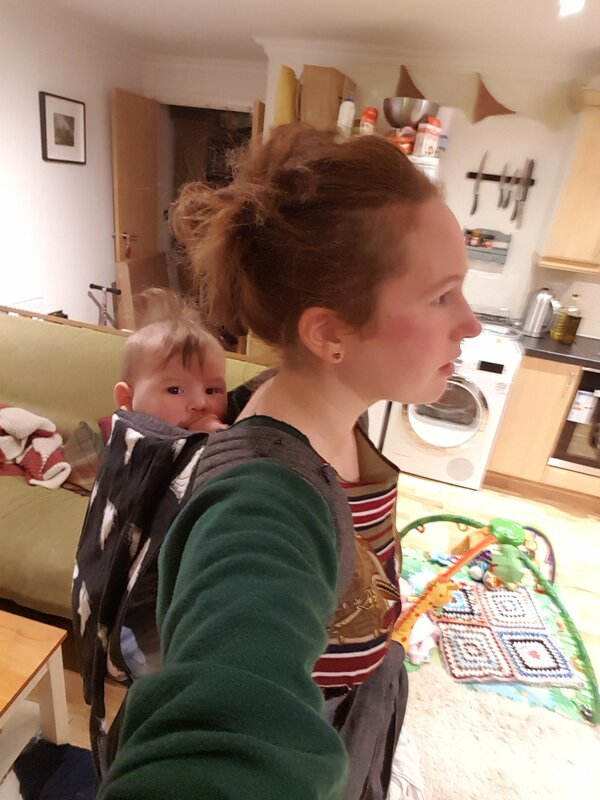 Granted, it was a bit fiddly to negotiate the lengths of fabric but I soon mastered a ‘popable’ carry which meant I could leave it tied on and just pop him in and out as needed. In the early weeks it was the only place he would nap for longer than 30 minutes. 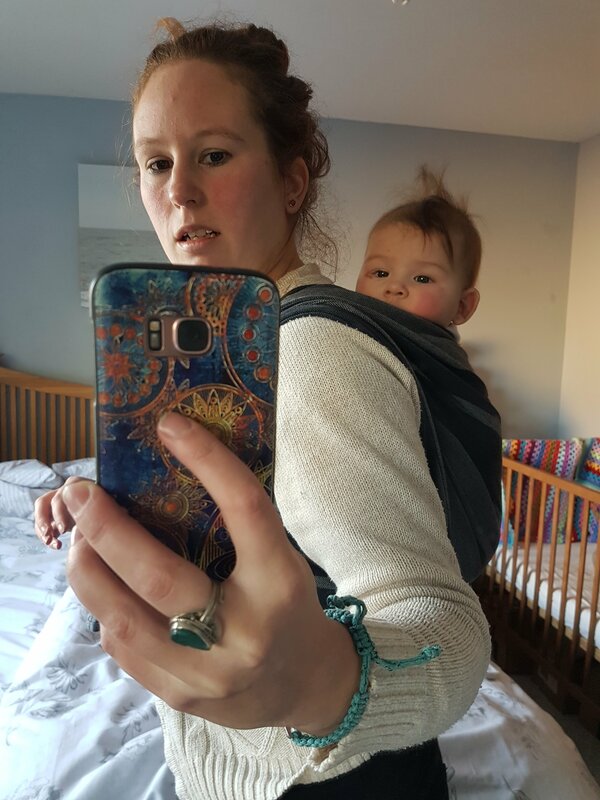 We used the Moby until he was about 4 or 5 months, at which point he became heavy enough that I was having to stop to re-tighten pretty regularly. After that he was mainly a buggy baby, with short bursts in our pouch sling which then came good for quick nips out to the shops. 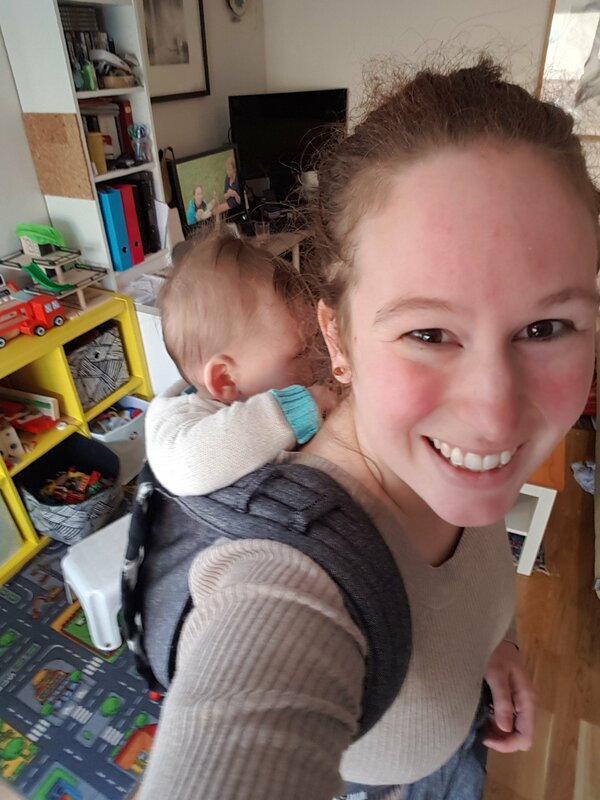 Finally, when he was about a year old, I purchased a soft structured carrier (SSC) – a toddler Patapum – and mastered back carries. Since he soon learnt to walk, we rarely used the buggy for our adventures from that point on. 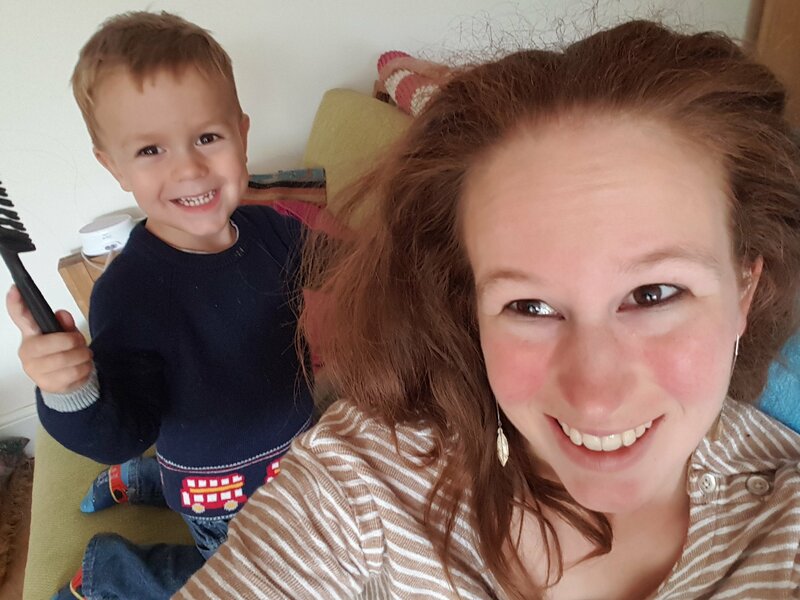 I wore Tom until he was 2 and a few months and would have continued… except I was pregnant with Piper and found the weight too much for my changing body. But I knew that I would want to carry Piper from birth, so I could have my hands free for Tom. 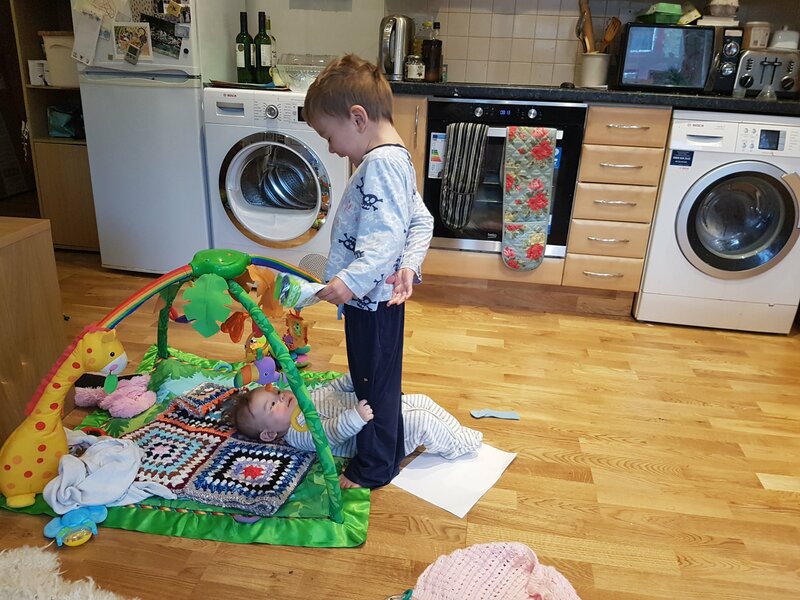 My mum stepped in again and gave us another SSC, this one a Connecta that could be adapted for use from birth. I loved it. So easy and quick to put on, and comfy in a front carry even for long periods of time. Piper has so rarely been in the buggy that I can count on my fingers the number of times and not use them all (and she is almost 6 months). 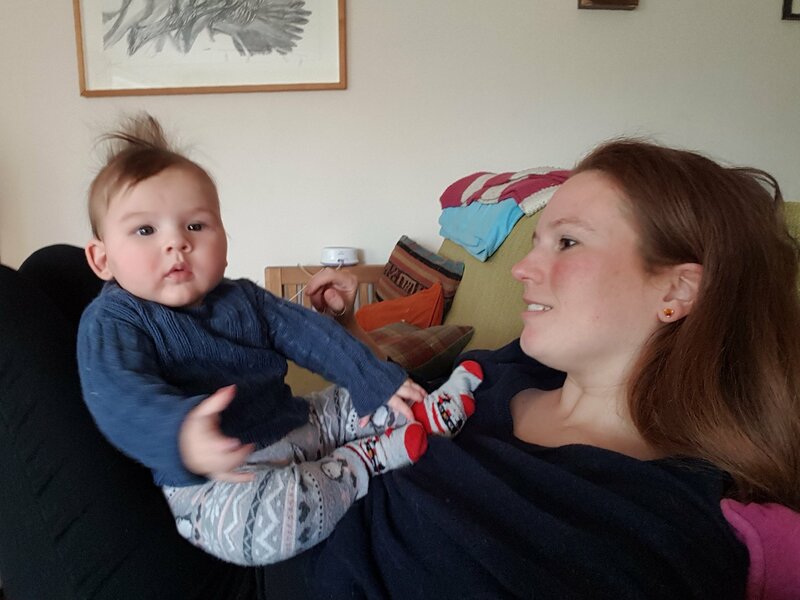 Recently though, I’ve been finding that she is getting a bit big to have on my front during longer trips, especially when we do the nursery drop off and I have to negotiate the stairs with a buggy and all our bags. She’s tall enough that I find it difficult to see around her going down stairs, which doesn’t feel safe, and heavy enough that having her on my front whilst carrying a buggy made me feel a bit off balance. Plus she is getting too big to easily reach around. Since she is now strong enough to sit for short periods, I wanted to start back carrying, especially for longer trips. I was comfortable using the Connecta and was already used to back carrying from Tom, so we gave it a go. And I was sad to find that I hated our lovely Connecta for back carrying. It was diggy even after just a short period, no matter how much I tightened. I couldn’t get her high enough on my back to be able to see her. When she fell asleep, she would face plant into my back meaning I panicked every few minutes and had to stop to check she was breathing. And the waist strap dug into my ‘mummy tummy’ making me look like I had a few extra rolls of fat. I have always been a bit daunted by woven wraps (despite thinking they are beautiful), but I found a secondhand Little Frog on Ebay for a song and decided to give it a try. I’m very much still a beginner with it, and struggle to keep a good seat when attempting anything that involves a sling pass (one day I will master a double hammock, one day), but I can now manage a passable rucksack with fairly little effort. It does take a while though and, especially now it is winter, I’d struggle to manage it out and about. Enter my final purchase, a wrap conversion mei tai. I saw that these Soul Meh Dai’s were pretty reasonably priced, and had amazing reviews so I went ahead and ordered one (we don’t have a sling library close by otherwise I would have rented first). It arrived yesterday and I did the nursery drop off and a few errands in it today. It is AWESOME. Padded shoulders prevent digging but I can get her nice and high on my back. No buckles, so no tummy squidging issues and wrap straps mean I can spread them to do fancy chest belt finishes or to add an extra reinforcing layer to her bum. And it is still fairly quick to put on, with no way for Piper to ‘pop’ the seat, the way she can with my inexperienced wrap jobs. I’d still like to master wrapping since I feel like it will be the most comfortable way of carrying for really long periods (just not loving ruck straps so need to get some other carries under our belts). And I can imagine using the Connecta for quick trips out when I don’t want to faff about with tying lots of fabric. But I’m going to be reaching for the mei tai most for the immediate future. Piper turned 22 weeks on Thursday 26th October, making 26th October to 1st November her 23rd week of life. Here’s what was going on for her this week. What we did: We spent the weekend with my parents and took a trip to the zoo at Tilgate Park on Saturday afternoon. Piper’s a bit young to appreciate the animals, so she just rode in the sling, and had a quick nap. She enjoyed some cuddles with granny and grandpa too. On Sunday morning I took her to see my grandparents. They are both in their 90s and now quite frail, so I left Tom with my mum, but was keen to see them and for them to see Piper, especially as we had missed my grandpa’s party a few weeks before. The rest of the week we were in our normal home/nursery routine. Feeding: Both bottle and breastfeeding are fine, though she is now at the age of being very distractable whilst breastfeeding. She bobs on and off constantly wanting to have a good look around. She’s been sitting in her high chair while Tom and I eat dinner. Since she is really into textures currently, I gave her some potato and bread to play with one evening. And she ate it. Which was a bit unexpected! 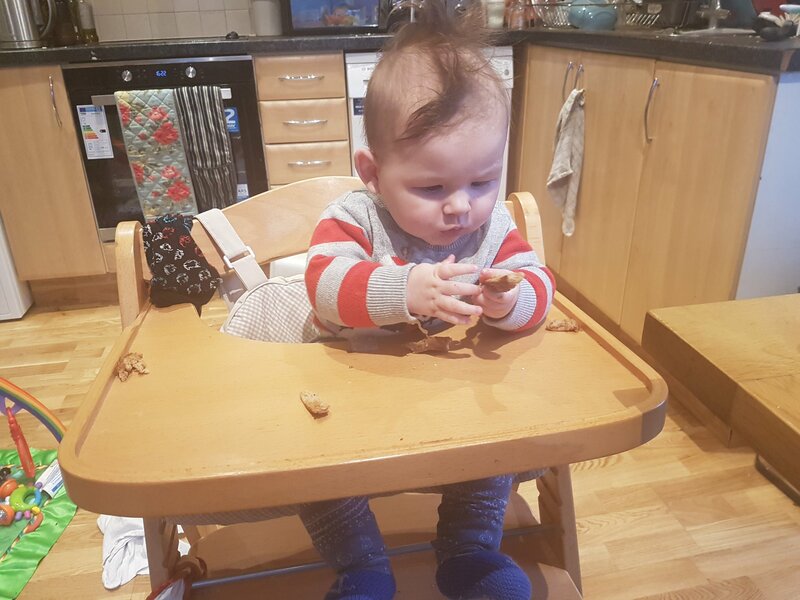 I remember the same thing with Tom (we do baby led weaning) – I gave him some food assuming he’d just play with it and was shocked when he actually ate it. Sleeping: Naps were still very hit and miss this week. Most days she would have one long nap (either in the morning or at lunchtime) and then one short one. Some days she only had short naps and would then be overtired by bed time. She had a mild cold which contributed to some of the bad napping. Nights were mainly OK. She slept through on Friday and Monday, but both times woke a bit early to start the day. 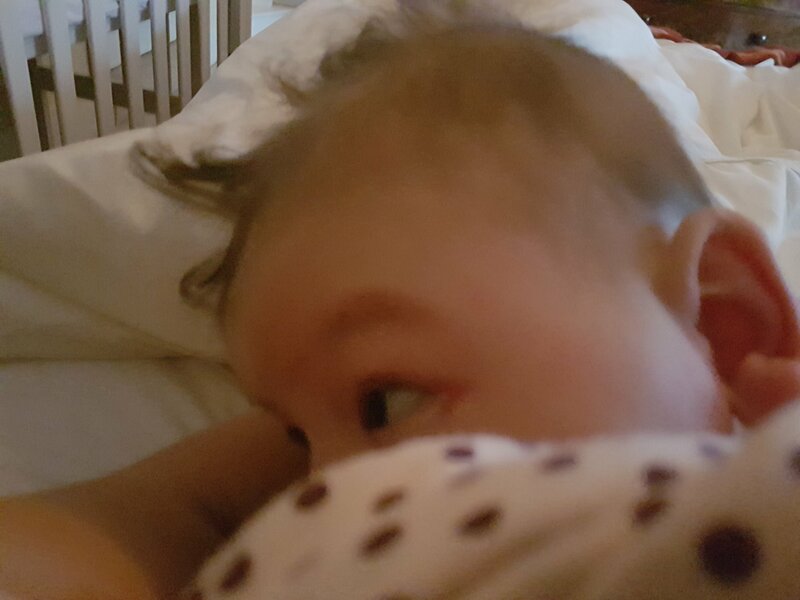 Most other nights, she woke briefly a couple of times and soothed herself back down with her thumb straight away. If she was sleeping in a different room from us, I’d probably think she was sleeping through, because it literally is a single cry out and then back to sleep. I don’t even know if she is fully awake doing it but it does wake me still! We had one really bad night, which was Saturday, when we were away at my parents. And also was the clock change night, just to add to the misery! She has never slept well there and was up from about 3 (new time) until 6 (new time) then did have a half hour doze. I fed her that night for the first time in a week (and only time that week) but it made no difference. I just can’t work out what it is there she doesn’t like. It was dark, everyone else was asleep (so it was quiet), and she used to sleep badly there in her Moses basket too, so I don’t think the cot is to blame. I’d hoped finding her thumb would have solved the issue but clearly not. 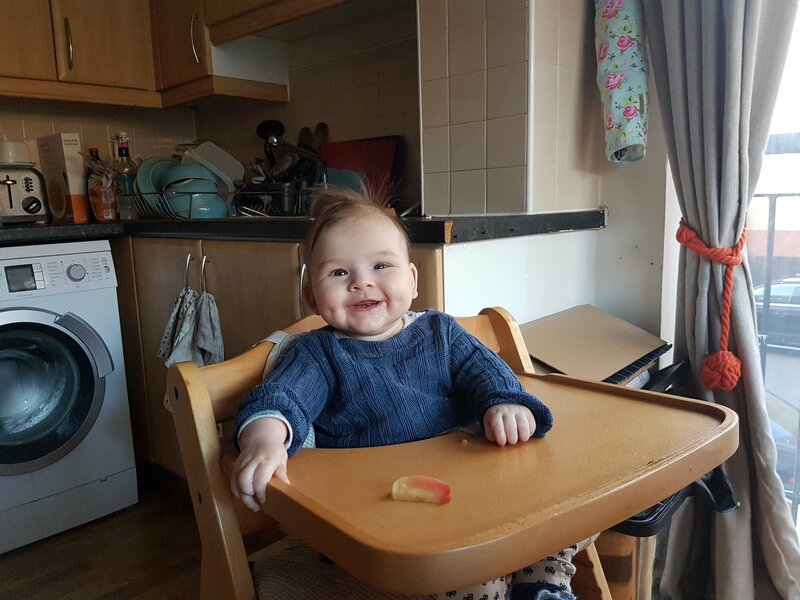 Working on: she managed to sit solo for about 10 seconds and is looking way less lurchy in the high chair. Other things: She had a mild cold this week so was a bit fussy during awake times, especially on days she didn’t sleep so well. She also is now in Wonder Week 5 which may be contributing to the fussiness. Piper is very sensitive to loud noises. Tom making ‘rar’ noises and me using the food processor both set her off this week. Her little face just crumples. It is the saddest expression I have ever seen and Tom and I both rush to comfort her when it happens. 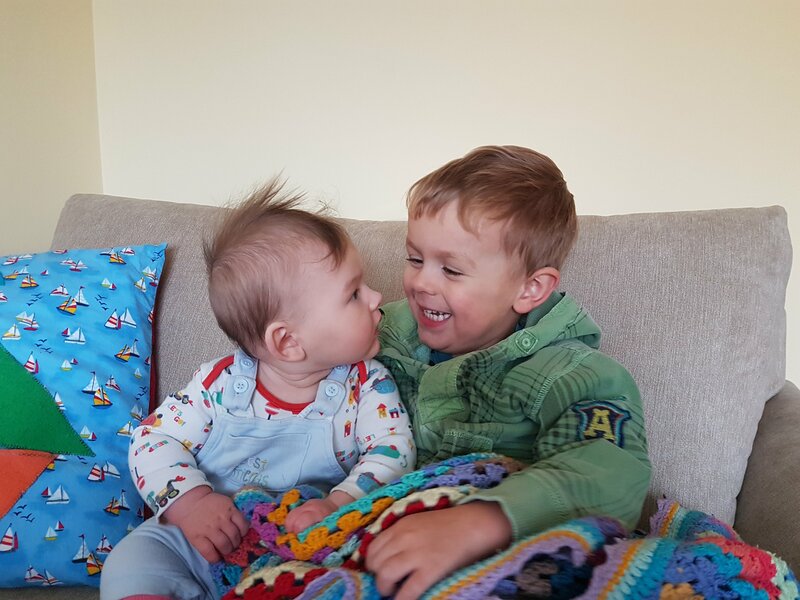 What we did: we’ve had a much calmer month, but that didn’t mean there wasn’t lots of fun to be had! We kicked off the first week of October celebrating my niece and I’s birthday (6 October). We went to my in-laws the day before so that Tom and Rose (my niece) could experience their first theatre trip. I stayed behind to look after Piper, but they had a great time with Granny and Grandpa. Tom’s account of the play was slightly garbled, but it seems to have featured a dog and possibly a cow. He seemed to enjoy it anyway. The next day we went out for lunch at a tapas place near our old flat in Walthamstow. Tom behaved beautifully and really enjoyed all the different foods. 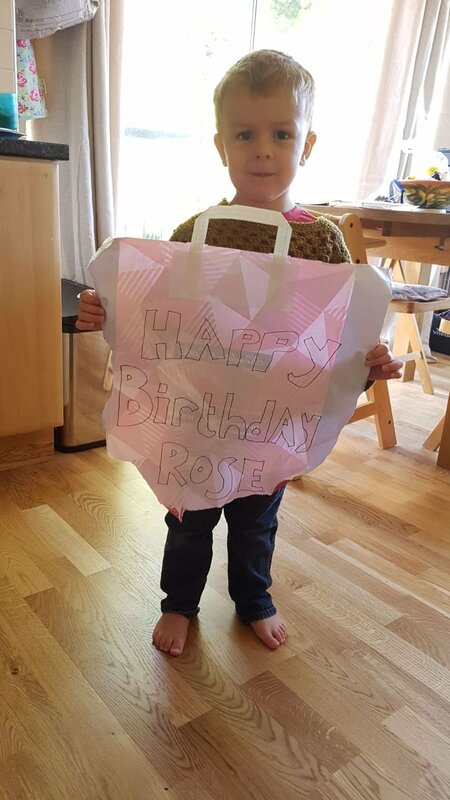 That Saturday was Rose’s birthday party, again at my in-laws house (they live near Waterloo so it is a convenient gathering place). There were a lot of kids there, aged from 4 months to 11 years, and Tom found the experience a bit overwhelming. 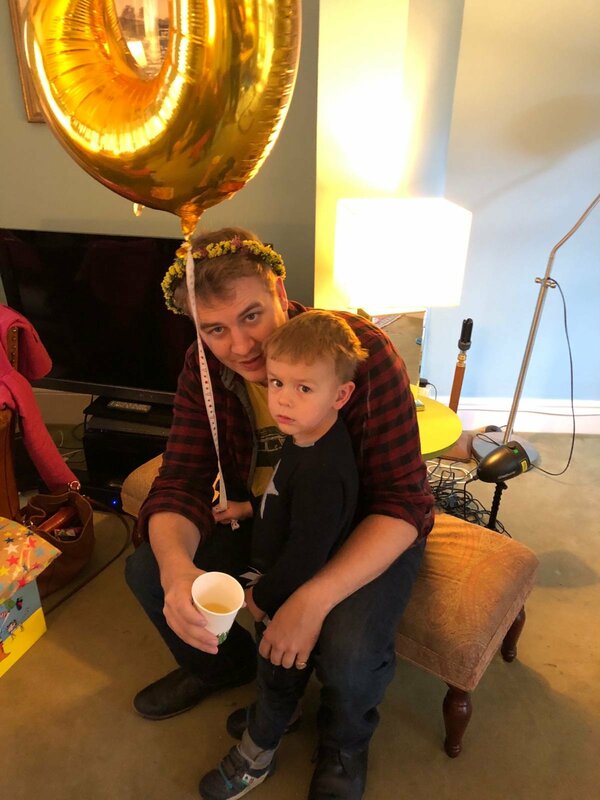 By far his favourite parts of the day were the beginning and end when he had Rose (and the balloons) to himself. We were due to stay at my parents’ house the weekend of 15th October, in order to attend my Grandpa’s 93rd birthday, but ended up not going because Tom, Piper and I all came down with a cold. Tom was probably the least miserable of us all and, if it weren’t for all the snot, I’m not sure I would even have known he was ill.
We saw quite a few friends for meals this month. Harry (Piper’s godfather) and his wife Mahtab came round for lunch on the Sunday after Rose’s party and brought their dog Rollo with them. 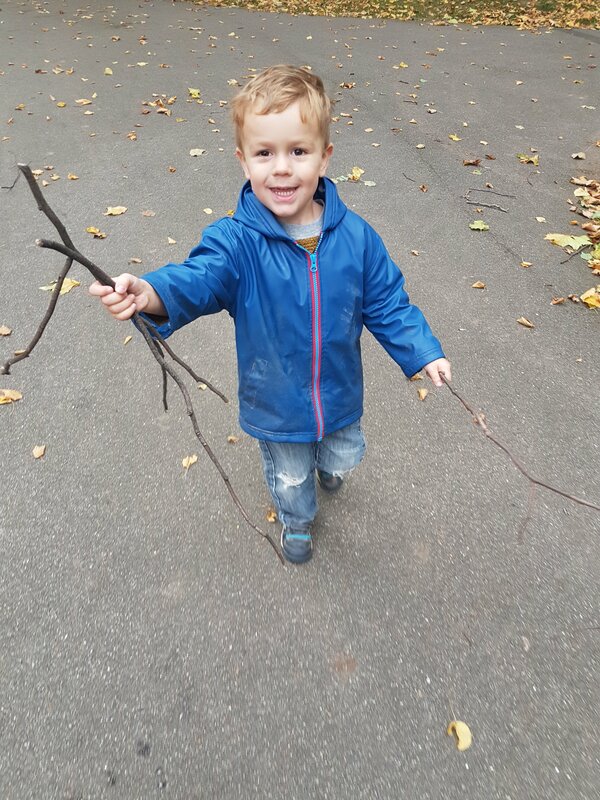 Tom was really adventurous with the Moroccan food I cooked and then had a great time taking Rollo for a walk in the park, where he also made friends with a little boy called Seb. Tom’s godfather Jon and his (pregnant) wife Betsy came round for lunch in mid-October. They didn’t bring their dog, mostly because they live in the States (Betsy is American). We rarely get to see them due to living on different continents, but I think Tom did remember Jon from various Skype conversations and seeing them at a friend’s wedding in March. At any rate they had some great bonding time and Tom was sad to see them go. Another of Tom’s godfathers, Alex, his godmother Becky, and their partners came for dinner towards the end of the month. Tom was allowed to stay up slightly late to see them but was more interested in going to bed than chatting. We spent the last weekend at my parents’, making up for the visit we had cancelled earlier in the month. Tom, as always, had a great time – he loves my parents. We went to a little zoo in Tilgate Park and Tom ran around spotting all the animals. 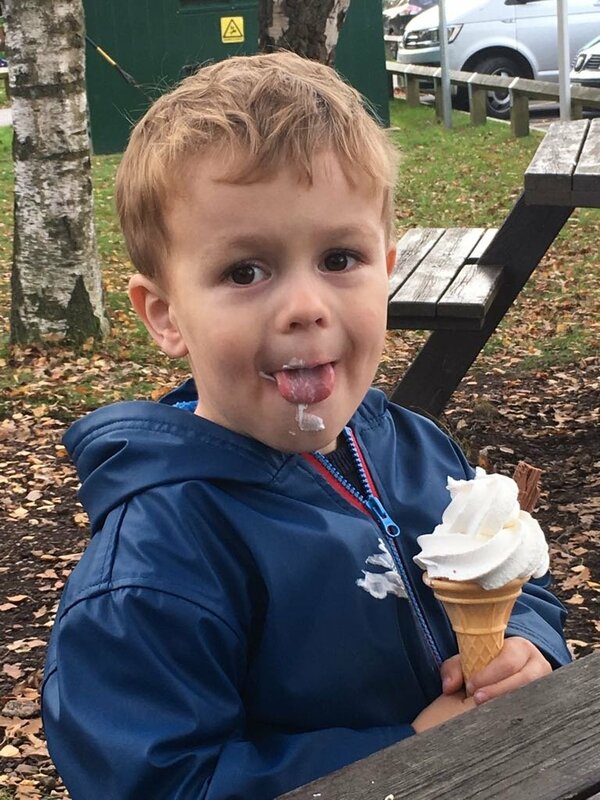 He was treated to an ice cream that was as big as his own head. He also loved exploring their garden as usual. Now we are settled into the new flat, Tom and I have developed a routine of leaving Piper with John whenever he has an evening shift and spending the morning in the park. 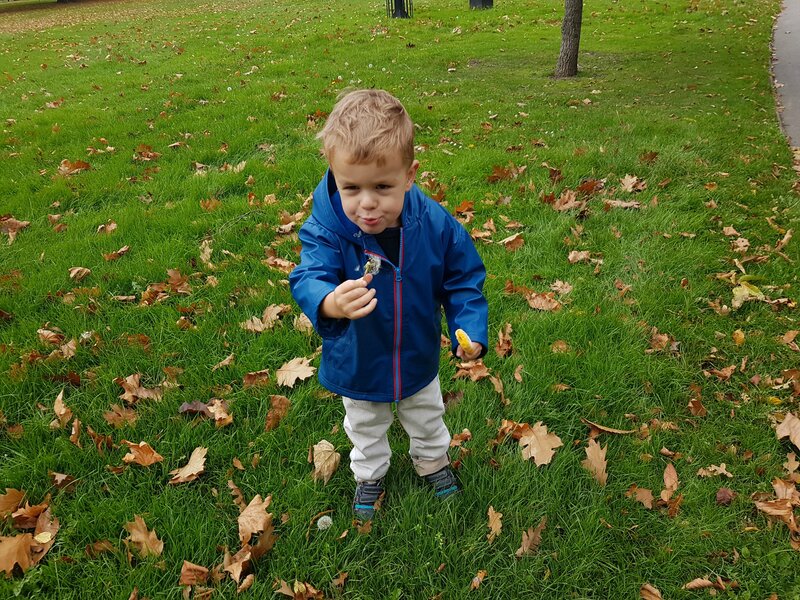 Not only is this great outdoors time, but Tom has been gaining confidence in playing with other kids, notably another three year old called Jake, who is just a month older. His mum and I now try to go at the same time so the boys can play (and we can chat). Behaviour: Tom has really mastered saying ‘please may I have’. He went through a brief patch of spitting but it stopped pretty quickly once John and I had expressed our distaste! He is so good with Piper these days. He brings her toys, shares his blankies with her, and tries to comfort her whenever she is crying. He also makes her laugh with all his antics. Generally this month he has been extremely lovely. He’s been kind and helpful (most of the time). I think he is starting to develop empathy as he showed a lot more concern for my feelings (and Piper’s) and seemed to want to act in a way that would make us happy. Working on: He’s mastered pants and trousers and is now working on taking off his own t-shirt. He can also do his own zip up now. 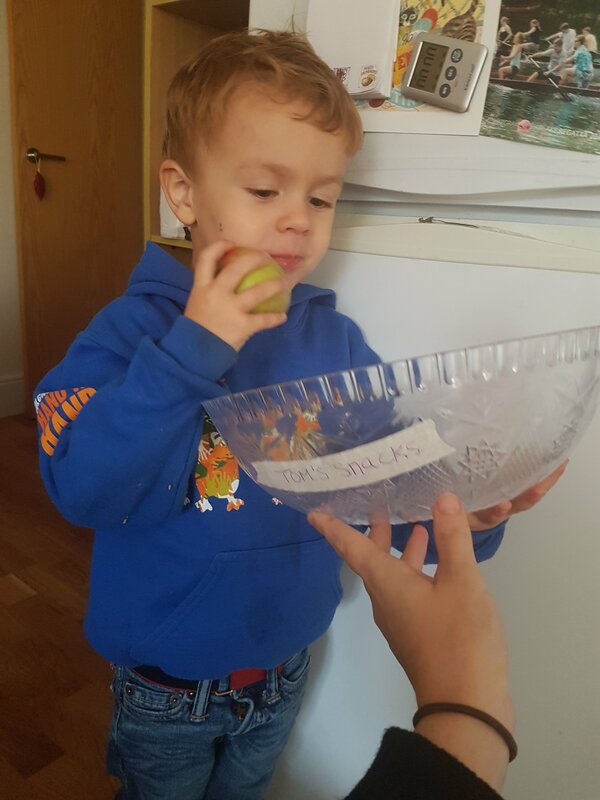 He has been learning phonics at nursery and can even write ‘t’, ‘a’, ‘o’ and ‘d’. They do a programme called RWI which is also followed in all the schools we’ve been looking at. He’s been bringing me our letter magnets to find out what they say and can identify a good number of them now. 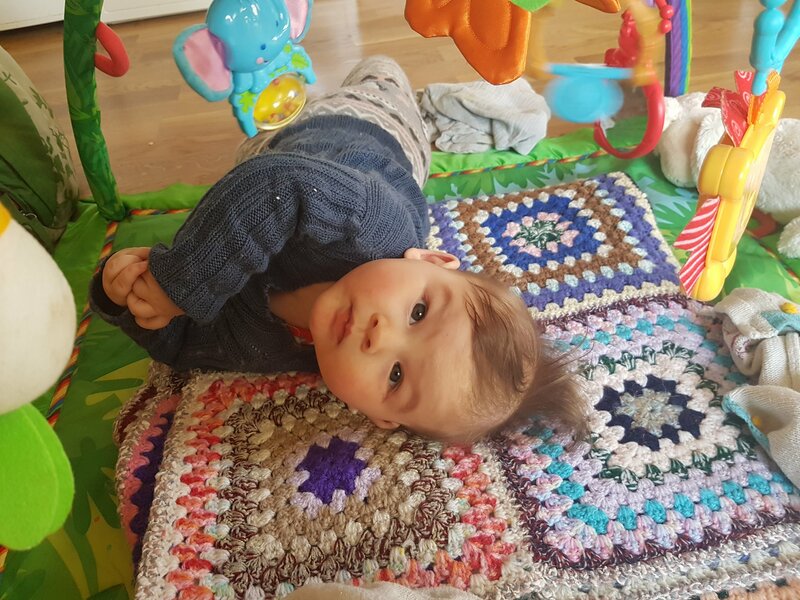 We believe in being very child led at home, so would never push him to learn letters, but since he is interested we have been following his lead and encouraging him to show us what he has learnt. 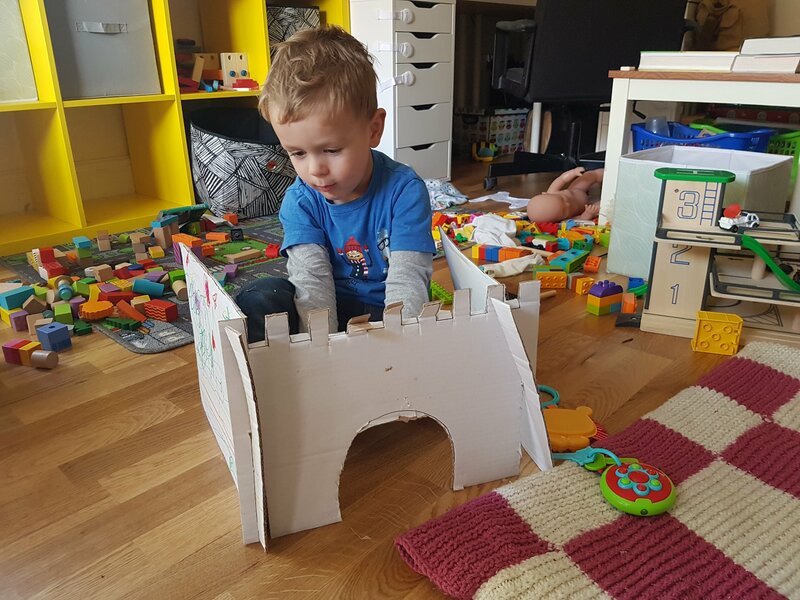 Playing with: Tom has been especially into Duplo this month and builds the most amazing things. He has also been singing a lot. 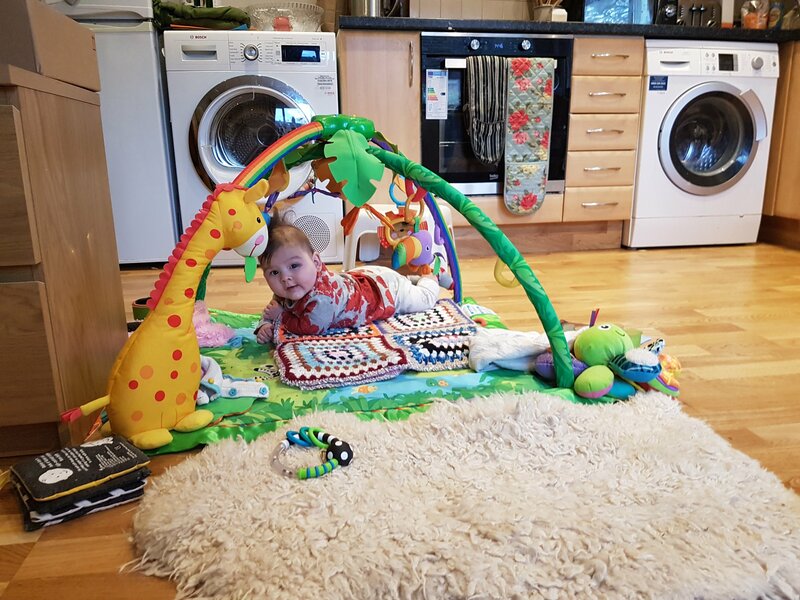 His favourite songs are ‘Wheels on the Bus’, ‘We went to the Animal Fair’, ‘Old Macdonald had a Farm’, and the theme tune from the show Dinosaur Train. Sleep: He is still slowly dropping the nap and often just plays. 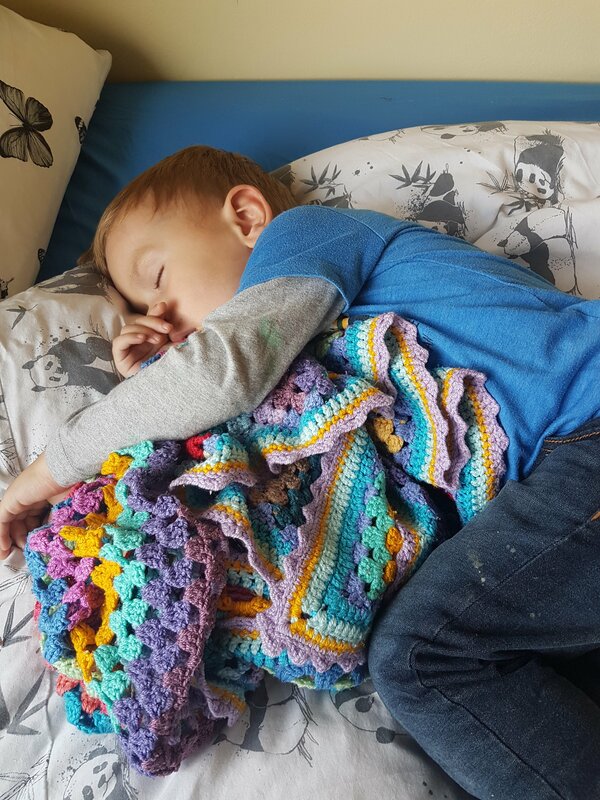 We’ve stopped putting him down unless he specifically asks for ‘stories and sleep’ but he will often just go curl up for a bit, especially when he had the cold. He had a few mornings where he decided to ignore the gro clock and to wake me up a bit early. After a couple of encounters with a cross mummy, we had a chat and I explained that I don’t like being woken early. Since then he has respected my sleep and will just entertain himself. We have a potty in his room so that he can use it if he needs to and doesn’t have to wait for us. 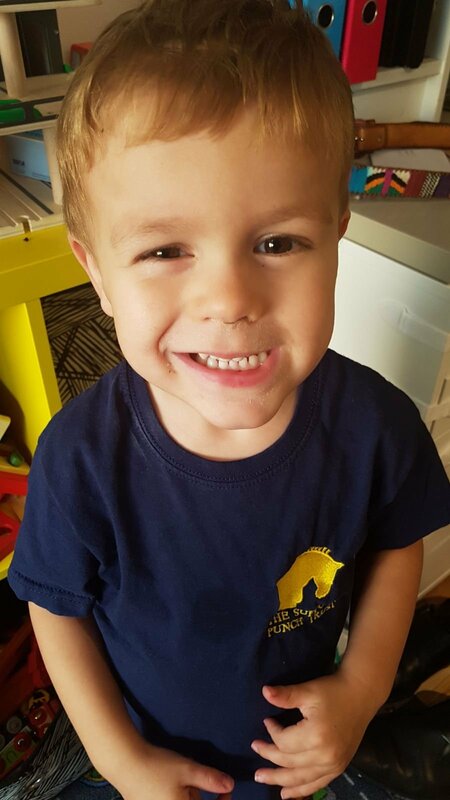 He handled the time change brilliantly – one early morning and then we were back to normal. Eating: Tom has been so adventurous with trying new things this month and even had some quite spiced food, including Thai (non spicy) and Moroccan. At the end of the month he and I agreed that he should be allowed a snack bowl with food he can help himself to during the day. We’ve put a few rules in place and will see how it goes. Other things: Tom now wears 3-4 year old sizes, but needs a belt for the trousers. 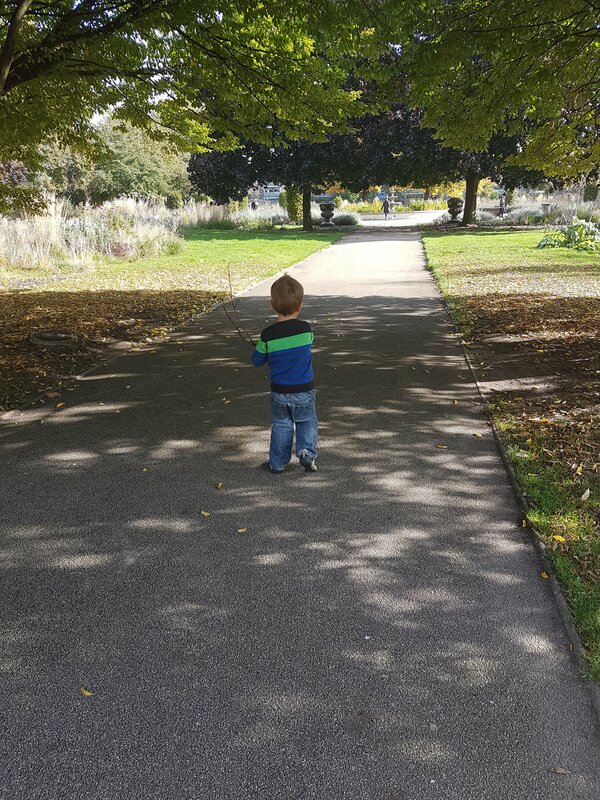 He’s getting much more confident talking to other kids, both at nursery and in the park. He always asks ‘what am I going to do when I’ve had my sleep’ when he goes to bed and wants to know if a meal is lunch or dinner. I’m considering getting him a magnetic calendar so he can see the pattern of his day. He asks ‘who buyed that’ about everything he sees. This can be quite annoying since he sometimes refuses to believe my answers! He thinks the grocery shopping is ‘buyed’ by the delivery man, which I find irritating when I have paid for it… Need to work on the difference between ‘brought’ and ‘bought’ I think.